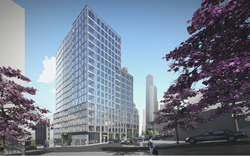 The 203-unit, 17-story KODA Condominiums will be built at 450 South Main Street at the gateway to Seattle's historic International District. The Reservation Agreement is a first right of opportunity offered to consumers in exchange for a fully-refundable $5,000 deposit that will be held in escrow. Reservation holders will be provided notice when the final product offering is released by the seller including the final floor plan, confirmed specifications and a fixed price within the quoted price range – just as soon as that information is a validated by the architect, contractor and members of the development team. Reservations holders must be prequalified by the preferred lender, Caliber Home Loans, in order to maintain a reservation. The seller will accept multiple positions for reservations in the event a prospective buyer’s first choice is already reserved. Hsieh notes that the cost of development is rising alongside the cost of housing, making it more difficult to set pricing during presales. To be sure, downtown Seattle is the fastest-growing large city in the US with record numbers of developments taking shape, resulting in construction hard costs rising between 6-8-percent per year. The median home prices of resale condominiums rose 19-percent in 2017, according to NWMLS records. KODA Condominiums is one of the few, new for-sale developments being offered in downtown Seattle as most developers have preferred to build apartments for rent. According to RSIR research, more than 27,000 housing units will be delivered downtown in the current decade but more than 94-percent of this supply is planned as apartments. The Urban Land Institute cited Seattle as the top market for investment in their 2018 Emerging Trends in Real Estate report. Downtown Seattle has added 65,000 jobs since 2010, according to the Downtown Seattle Association, and it’s estimated that 1,100 new residents are moving into the Seattle metro area. Seattle moved up to No. 7 from No. 10 in Redfin’s rankings of the best US cities for public transit in 2018. In their media release Seattle Mayor Jenny Durkan called Seattle “one of the most transit-friendly cities”. In order to offer a higher volume of more affordable units, Da-Li International borrowed several design and development principals from their 30-years of experience building condominiums in Taiwan. The units include in-line kitchens with optional (flexible) islands providing additional storage and eating areas. Access to the traditional bedrooms are located along the window wall reducing single-purpose corridors in the home and opening up light and views. The building is designed as a vertical neighborhood offering a robust collection of amenities including a grand lobby with co-working spaces, a 7th floor fitness center, yoga room, library and conference room as well as the 17th floor KODA Club – a voluminous lifestyle center complete with a screening room, billiards room, fireside lounge, a catering kitchen, a private dining room and access to the rooftop terrace offering BBQs, fire pits and outdoor seating areas with expansive views of Mt. Rainier, the Stadium District, Pioneer Square, Elliott Bay and Seattle’s dramatic skyline. All homes will be offered without parking – treating the automobile as an option as opposed to an obligation reducing the average purchase price by an estimated $75,000, according to Jones. He notes KODA is just a block away from the King Street Station and the terminus of the planned Sound Transit 3 initiative – a $50+ billion regional transit plan that will bring 116 miles of track to in-city neighborhoods and exurban locations. Located in the heart of Japantown, or Nihonmachi as it’s also known, KODA is poised to be an iconic landmark that will become a centralized gateway to the historic Chinatown-International District to the south, to Pioneer Square and the revitalized waterfront to the west, to the redevelopment of Yesler Terrace to the east, and to hundreds of thousands of jobs in the Central Business District to the north. The immediate neighborhood is experiencing an urban renaissance of development given its availability of land, overlay of high-rise zoning and close proximity to job centers, residential services, attractions and transportation options. KODA Condominium is designed by KMD Architects with pre-construction services offered by PCL Construction. Caliber Home Loans is the preferred mortgage lender. Marketing and sales are being provided by Realogics, Inc. and Realogics Sotheby’s International Realty, respectively. Title and escrow services are provided by First American Title and Escrow. Da-Li International, LLC was introduced by Becky Lee of RSIR and Taiwan Sotheby’s International Realty. For more information, visit http://www.ownKODA.com. About Da-Li Development – Taiwan-based Da-Li Development is a publicly-traded company principally engaged in the development, construction, leasing and sales of properties. The Company’s principal businesses include the development of residential buildings and mixed-use buildings, such as condominiums, commercial retail shops, villas, private clubs, and parking spaces. DAL-LI formed DA-LI Development USA LLC in 2015 and purchased two commercial retail shopping centers in Washington and is developing the KODA Condominiums in downtown Seattle. About Realogics Sotheby’s International Realty (http://www.RSIR.com) - Realogics Sotheby’s International Realty is a leading global sales and marketing brokerage firm in the Pacific Northwest that specializes in new condominiums. Recognized by the Puget Sound Business Journal amongst the fastest-growing private companies in Washington State during the past five years, the boutique real estate firm of 220+ brokers consistently rank among the top producing firms within the markets that it serves with branches in downtown Seattle, Bainbridge Island, Kirkland, Issaquah and Madison Park. EDITORS NOTES: For high-resolution photography, video, floor plans and new renderings of KODA Condominiums contact Krista Dunn at 206.448.5752 or email Krista(dot)Dunn(at)RSIR.com.